It's been crazy busy around here. AND terribly hot. The high today was suppose to reach 105 and the last time I checked our thermometer it read 103!! Tomorrow is to be the same. We didn't go camping last weekend like we'd planned....was going to be in the 90's and that is just too hot. So B (my hubby), C and I took a trip over to Multnomah Falls. BTW I have no idea who that girl is in the photo with my guys, but I should've taken a cue from her....then maybe I'd be in some of the pictures that were taken that day. B and C are TROOPERS I tell ya! They made it to the top. There was no way our boy was turning around and coming back down until he made it all the way. I gave up on switchback 3 of 11. I should have kept going....oh well. I had a spectacular time just people watching while the guys were hicking. I finally took the plunge and got some chickens!! Four beautiful Black Sexlinks. 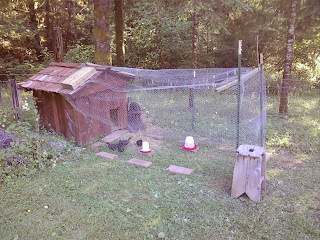 All girls....they're not laying eggs yet and are called pullets until they are a year old, then they will be hens. No way could I get a rooster...he'd be dinner the evening of the first morning he crowed and woke B up...so it's better to not test those waters just yet. The heat is getting to them though...my son thought it very interesting that they pant like a dog to try to cool down. Those chickens adore him! He would spend uncalculated amounts of time talking to them and feeding them leaves when they were in the temp pen. Now they have a lot of greens to eat, but when they hear him...they are beaks to the fence, waiting for their treats from the little 5 yr old boy.